One of the main mantras that is seen for extra distance is High Launch, Low Spin. So for extra distance we should look to increase the launch of the drives while also lowering the spin. This is true for a lot of golfers but not all, some need to increase spin, while others would be better served by lowering launch. A better mantra would be 'Optimise', i.e. seek out the optimal launch and spin for each player. For a player with 100 mph club head speed, optimal is around 14 degrees launch and 2500 rpms spin. For lower swing speeds these figures are slightly higher and for higher swing speeds these figures are slightly lower. However for the purpose of this blog post, let's look at ways of reducing spin. The easiest and cheapest way of reducing spin is to use a different type of golf ball. For example the Titleist ProV1X in general spins less off the Driver than the ProV1, the NXT Tour and Velocity spin even less and solid two piece balls such as the Pinnacle even less again. The next way to lower spin is to use a different club head. Clubs with less loft spin less. Also clubs with higher and closer to the face center of gravity reduce spin. These type of clubs normally have a deeper face. A good illustration of these points is the difference between the Titleist 913D3 and D2. The D3 has a deeper face with the center of gravity higher up and closer to the face, this promotes a lower launch with less spin, D2 is shallower and also has the center of gravity lower and further back in the head, promoting a higher launch with higher spin. One of the common ways to look to reduce spin is to put a low spin shaft in the driver. Interestingly Tom Wishon states, from his testing, that the difference between the highest spinning shafts and the lowest spinning shafts is only 700 rpms. Some golfers look for exotic expensive shafts to reduce spin but a similar reduction can be achieved by changing ball. Sometimes, changing the ball isn't enough so some of the shafts that will reduce spin are slightly heavier (75 grams and up), overall flex is stiffer, and the bend profile of the shaft has a stiffer tip. Some golfers tip the shafts by 0.5 or 1 inch to stiffen the tip even more. With the gear effect on a driver head, striking the ball higher up then the center of the club will both increase launch and lower spin. A quick explanation of gear effect is; on off center strikes the club head rotates around it's center of gravity, on woods toe strikes will try to move right to left, heel strikes left to right, bottom strikes launch lower with more spin and top strikes launch higher with less spin. The impact conditions which cause spin are spin loft times club head speed. Spin loft is the difference between angle of attack and dynamic loft. When spin loft or club head speed is increased spin is increased. 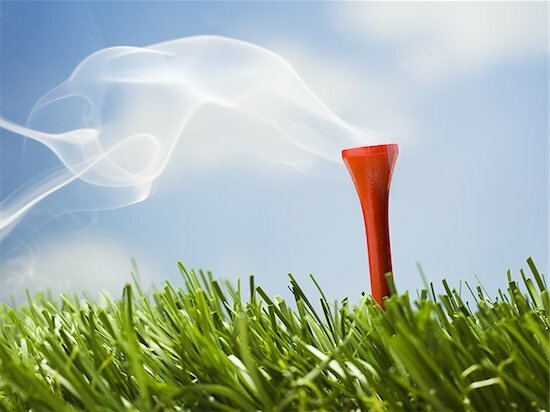 We're not looking to decrease club head speed, as we would like to hit the ball further. So we would look to decrease spin loft to decrease spin. The easiest way to decrease spin loft is to change the angle of attack. For example if we go from hitting down to hitting up on the driver we generally see a decrease in spin loft. Some ways to hit up on the ball include teeing the ball higher (also might help to strike higher on the face), moving the ball further forward in the stance and keeping the head behind the ball. If you have any questions or comments, please ask or post.